A stolen lorry left "utter carnage" when it ploughed into cars and then a house, killing a woman out power-walking near her home, prosecutors have said. A jury has heard how Jacqueline Wileman, 58, died when she was hit by the tractor unit of a truck after the driver lost control in the village of Brierley, near Barnsley, as he was being followed by a police car. The lorry ploughed into the house. The lorry then ploughed into a house, leaving the building extensively damaged, Sheffield Crown Court heard. 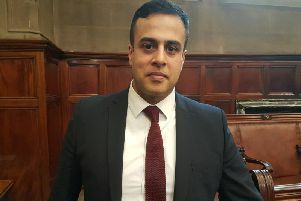 Prosecutor Jason Pitter QC said: "The scene was one of utter carnage, indicating the dangerous way the vehicle was being driven." Mr Pitter said the truck was travelling at at least twice the 30mph speed limit and on the wrong side of the road. CCTV footage was shown to the jury which shows Mrs Wileman walking briskly along the pavement. Moments later, a white truck is seen speeding past and debris rises from a violent collision with a car just out of shot. The prosecutor told the jury that Mrs Wileman had been power-walking near her home at the time of the crash on September 14, last year. He said her desire to maintain her fitness "tragically and ironically led to her death". The barrister told the court: "She was dragged along the road causing extensive injuries and she was immediately killed, such was the speed and dangerous way the vehicle was being driven." Mr Pitter told the jury on Tuesday that the driver of the truck, Karn Hill, has already admitted causing death by dangerous driving. Three men on trial, David Mellor, Wayne Carroll and Alan Mawhinney, all deny the same charge. Mr Pitter said these men were all in the cab with Hill at the time of the collision. He said: "It's tempting to say this was simply a case of Mrs Wileman being in the wrong place at the wrong time. But that would be to mistake the reality. "She was exactly where she should have been. It was these defendants, along with Mr Hill, who were doing the wrong thing at the wrong place at the wrong time." Mr Pitter explained how Mellor had taken the tractor unit from his employers and, on the day of the crash, the lorry had driven dangerously around the area all morning, with those inside making off from a number of petrol stations without paying. The prosecutor said those in the truck appeared to be laughing and joking. He said: "It was, in short, a laugh." He told the jury how the truck was spotted by a police officer as it approached Brierley on Common Road in the early afternoon. Mr Pitter said the officer decided to follow the vehicle to keep it in sight rather than chase it. He said the truck then appeared to drive in a "fast and aggressive way". Mellor, 48, of Bank End Road, Worsbrough Dale, South Yorkshire, denies causing death by dangerous driving. Carroll, 29, of Chestnut Street, Grimethorpe, South Yorkshire, denies causing death by dangerous driving and aggravated vehicle taking. Mawhinney, 53, of Calder Crescent, Kendray, South Yorkshire, denies causing death by dangerous driving and aggravated vehicle taking. Hill, 23, East View, Cudworth, has admitted causing death by dangerous driving.